Yes, you are reading this right. 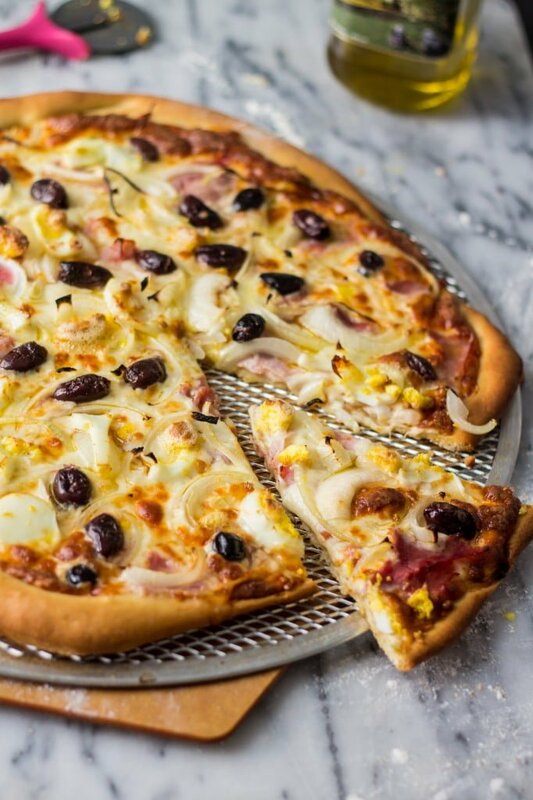 The name of this pizza is “Portuguese Pizza”! “But you said you were going to share a recipe for a Brazilian pizza!”, you’re probably thinking (or yelling at the computer!) Don’t fret, kiddos! This IS a Brazilian pizza!!! However, I have no idea why it is called “Portuguese Pizza”. I even tried researching and all I could find – from not very reliable sources – is that it is called like that because it has the colors of the Portuguese flag. But that doesn’t make any sense to me, because it is lacking the green…Maybe it used to have the colors of the Portuguese flag before, in the original recipe? Maybe they had peas or green peppers or something in it? I don’t know! Another version says that the Italian immigrants in São Paulo used to bake their pizza in the Brazilian bakeries ovens, cause there were no pizzerias back then. And who used to own these bakeries? The Portuguese! 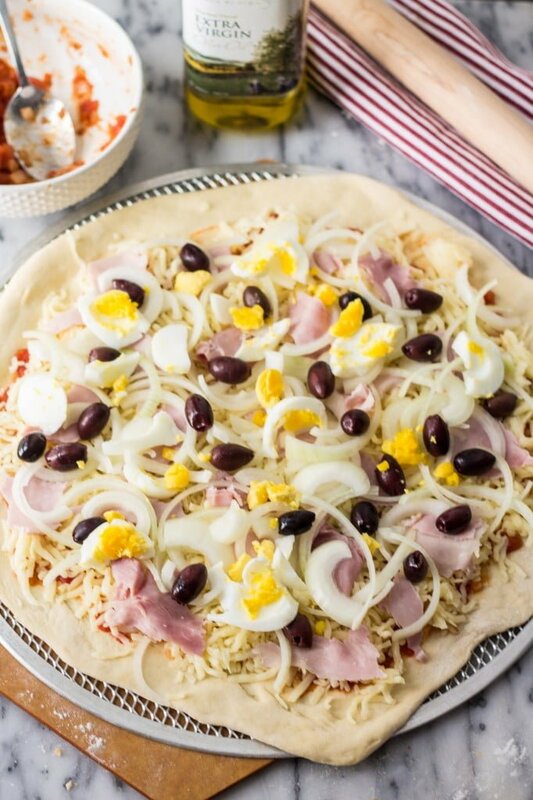 And so one day the Portuguese decided to make the pizza richer and added ham, olives and eggs to it, creating the latter called “Portuguese Pizza”. I have no idea if any of those stories are true… But honestly I don’t care! All I care is getting that delicious pizza in my belly!!!!!!!! I told you before that Brazilian pizza is one of the best pizzas in the world, right? Mostly in São Paulo, because of the huge immigration of Italians in the 19th century. The Italians taught us how to make pizza and we made it better! Lol You will not have a shortage of “Paulistanos” saying that their pizza is better than the one in Naples. They claim that it’s the quality of the ingredients and the inventiveness of the toppings. I’m not sure about the quality of the ingredients, since unfortunately I’ve never been to Italy, but we do have thousands and thousands of different pizza varieties. You would be impressed! Some of the common toppings are hearts of palm, catupiry cheese (which is a very creamy kind of cheese, similar to cream cheese but creamier and not as tangy!! ), fresh corn, sausages (the most common is the “calabresa” which is an Italian spicy sausage), shredded chicken, ham, onions, eggs, olives, and of course, tomatoes. We also have a huge variety of dessert pizzas! Some of the popular ones include chocolate, strawberries, bananas, dulce de leche, Nutella, guava paste and even ice cream! In São Paulo we are so serious about our pizza that we have our own Pizza Day, that happens on July 10th! We also have the tradition of having pizza with our families every Sunday night, either delivered to the comfort of our homes or in pizzerias. One thing we do not do, though, is have pizza for lunch (unless it’s leftovers), because most pizzerias don’t open until 6pm. Anyway, I don’t wanna annoy you bragging about Brazilian pizza because you might get depressed. Or, if you’re a New Yorker, we might get into a discussion that would last hours and wouldn’t get anywhere unless I could take you on a plane to São Paulo to taste our pizza. 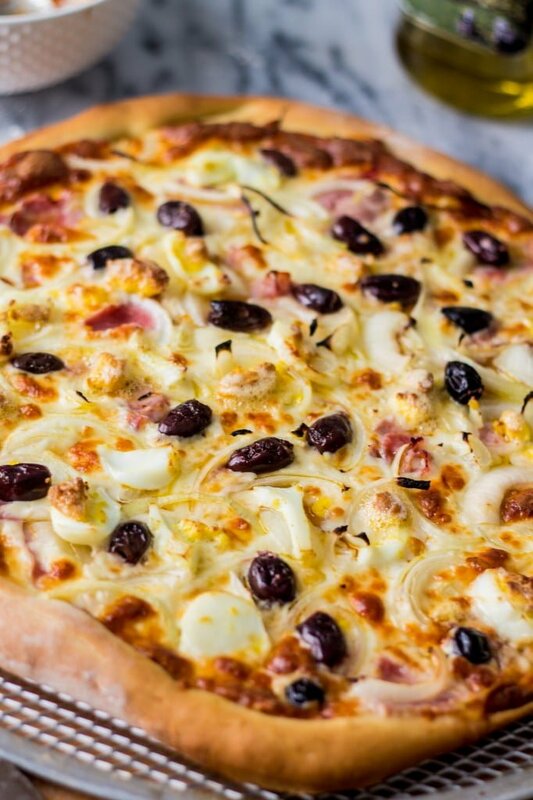 Since that won’t likely happen, you can make this Portuguese Pizza at your home and let me know what you think. How does that sound? Anyway, I hope you like this pizza as much as I do! 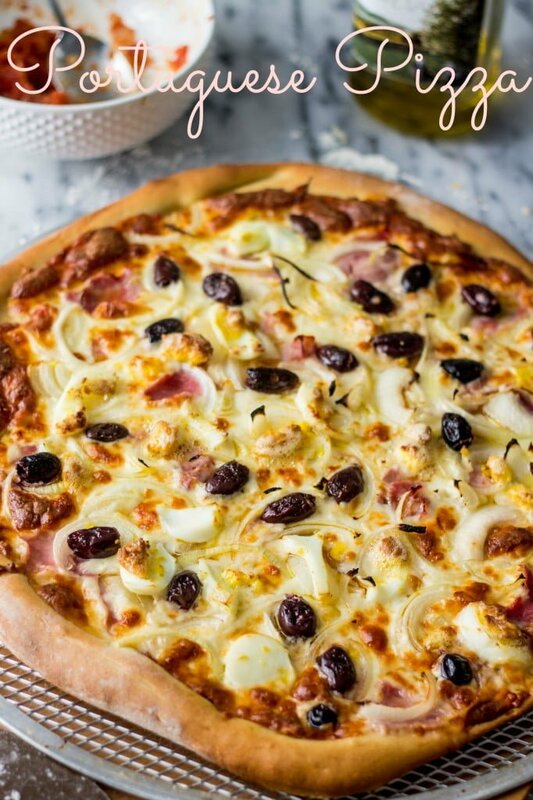 If you’re like me and you believe that there’s nothing better than homemade pizza, this is the perfect recipe for you! Enjoy!!! Preheat your oven to 500 degrees with the pizza stone inside. Sprinkle flour on your counter (or pizza peel, preferably) and roll your dough into a 16" circle. If you have a pizza screen, transfer your dough to the screen as it will make it easier to slide it on and off the oven. Spread the pizza sauce on the dough, making sure you leave about 1 inch for a crust. Add the shredded mozzarella and then top with the ham, the olives, the onion and the eggs. Sprinkle some oregano and drizzle with olive oil. 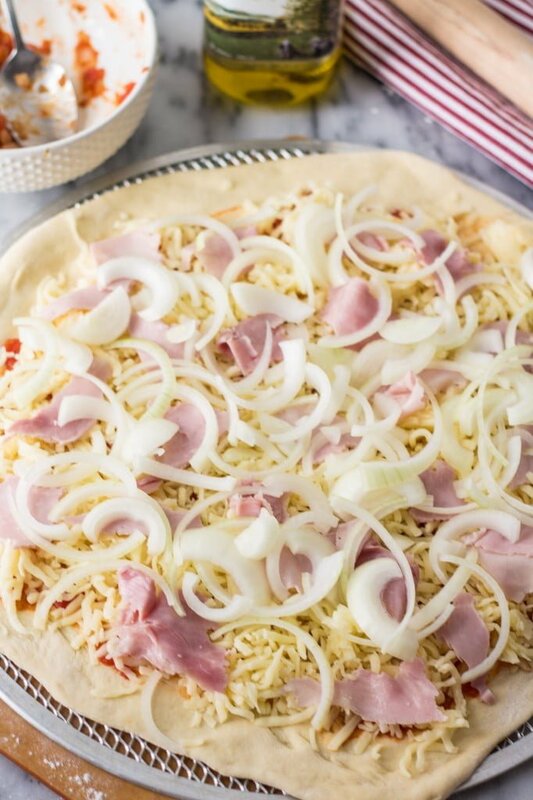 Bake for 10-12 minutes or until cheese is melted and onions are cooked. This pizza looks incredible Olivia! Craving a slice right now.. pinned! My friend this is my favourite flavour of pizza!This is definitely the best!!! Probably called Portuguese pizza because Brazil is (was) a colony of Brazil. having spent some time in Brazil, they usually add peas for the green, corn for the yellow, and it’s eaten with mustard. This is really a Brazilian pizza, The Portuguese version is “without” ham and instead they use palm hearts. Do you put the pizza screen on top of the pizza stone when cooking? Hi Lucy, I rarely use the screen anymore as I find parchment paper better. But yes, I assemble the pizza on the screen (or parchment paper) and I slide it into the stone! It was a trick I learned at a pizza class and I find it easier to move that way! I hope that helps!